Now that clients are booking you, they’ll be paying you after the appointment. Congrats, you’re officially killin’ it! But how will you accept and manage your client payments? Step 1: Consider getting a business banking account. Step 2: Set up an online bill to pay for your rent. You can have your rent money automatically deposited or have your bank send a check every month. You always want to have a way of tracking your payments so don’t ever pay in cash or any other untraceable method! If you don’t want to pay rent online, write a check and send it every month. Clients will ask if they can pay using Visa, AMEX, Mastercard, Discover, etc. Make sure that you find a payment processor that can process all major credit cards. 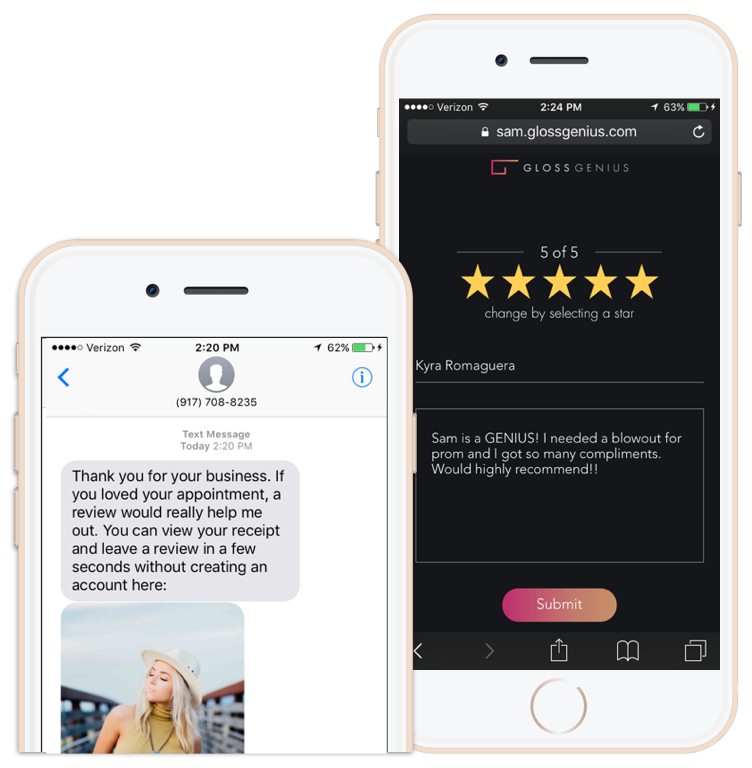 GlossGenius’s payment processor is brilliant because it gives you the ability to accept payments through the app, so checking out an appointment TAKES LESS THAN 60 SECONDS. Simple & Low Rates: The industry’s lowest payment processing fee at 2.6%. No hidden fees, regardless of if you scan or enter cards in. Ultra-Fast Next-Day Deposits: Deposits automatically land in your account next business day. Check out on Wednesday, have the money in your account Thursday morning! No clunky hardware: We make it easy. Just you and your phone. Customizability: The option to customize how you split the 2.6% credit card fee with clients. Security: We use the gold standard for payment processing. By partnering with Stripe, the world’s leading online payment processor, we give you the ability to accept payments through GlossGenius. Stripe is what many other well-known companies like Facebook, Lyft, SquareSpace, Shopify, and Adidas use for payment-processing, so you’ll be in good hands! You’ll also be able to store an encrypted version of your client’s credit card information, saving you and your client time! Clients love being able to get a receipt, and it’s a great idea to offer that to professionalize your business even more. After checkout, you can use GlossGenius to send your clients a text or email receipt. This is a great way to get them to leave a review easily since we remind them to leave a review when you send a receipt! Keeping track of your payments and sales with a good system will help you fill out tax forms in a breeze. GlossGenius enables you to keep all of your payment information easily organized and accessible in a few taps through sales and appointment reports to make tax season effortless for you. Also, set sales goals for each month! With GlossGenius, checking out an appointment lets you instantly integrate payment data with your business analytics and reports, making it easier to understand and grow your business! "You can't have a million dollar dream with a minimum wage work ethic. - Stephen Hogan."